The concessions made by the French government on Tuesday, December 4, do not appear to appeased the gilets jaunes protesters, who have vowed to continue their protests, prompting a series of cancellations and postponements, including - currently - two top-flight football matches, and a number of charity events. Even an annual Telethon event in Paris is under threat. As reported, Prime Minister Edouard Philippe announced on Tuesday the suspension of January's planned fuel tax hike, a temporary cap on gas and electricity prices, and rolled back on the stricter controle technique, which had been introduced in May. But protesters have said the concessions are 'too little, too late' and have called for a third day of demonstrations in Paris on Saturday - though a blockade of a fuel depot in Brest has been called off following Mr Philippe's announcement, with protesters there satisfied that their demands have been met. Two Ligue 1 matches, scheduled for this weekend, have already been postponed. Paris Saint-Germain v Montpellier and Toulouse v Lyon were both called off within hours of each other, following requests from local authorities. Interior Minister Christophe Castener has asked organisers of some 120 World Climate Marches in towns and cities across France on Saturday - including in Paris - to consider postponing. More than 60 associations have called on supporters to join the marches. 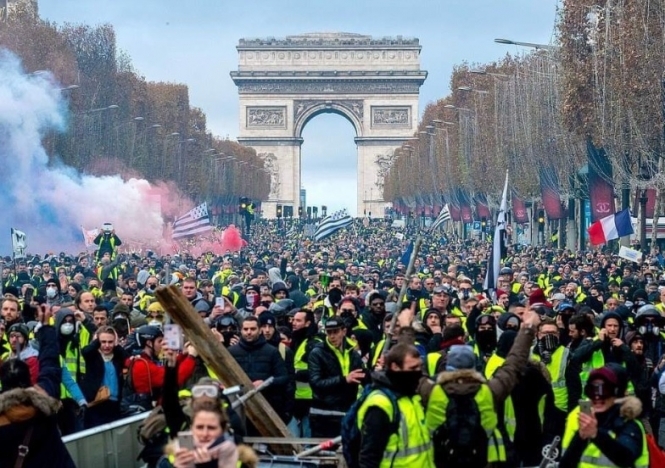 Early indications are that the Paris march will go ahead as planned, with the support of City Hall, though Mr Castener has indicated additional security discussions would have to take place before Saturday. Organisers of the Telethon, meanwhile, have said that they are still in talks with officials over preparations for a major televised event at Place de la Concorde, at the foot of the Champs-Elysées. Concerns over safety could see the event - which raises huge amounts for muscular dystrophy research - cancelled, though officials told franceinfo, "For the moment, we are still in the same format as we had imagined". But two other events have already fallen victim to the gilets jaunes protests. The Rare Disease Alliance has decided to cancel its 19th annual Rare Disease Walk, and the SPA has postponed its Noël des animaux event at Place de la Republique amid fears for staff and volunteers. The animal charity hopes to rearrange the event in early 2019.